Item Number: 810-1-04 17644 Actual Weight: 1 lb. 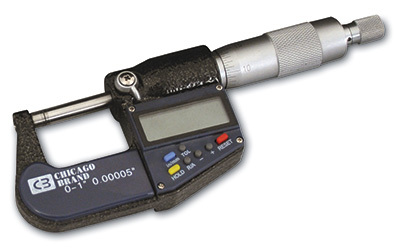 Accurately measure the thickness of poly and other materials for precise quality control. Standard features include thimble ratchets, carbide tipped measurement surfaces, thimble locks, a calibration wrench, and storage case. The digital micrometer displays outside dimensions to 100 millionths and shows "reverse" and "deviation" techniques. It also has a unique vernier scale to confirm the digital reading. Manual style also available.